As the EPI report lays bare, the common wisdom about our STEM problem is mistaken: We are not facing a shortage of STEM-qualified workers. In fact, we appear to have a considerable STEM surplus. 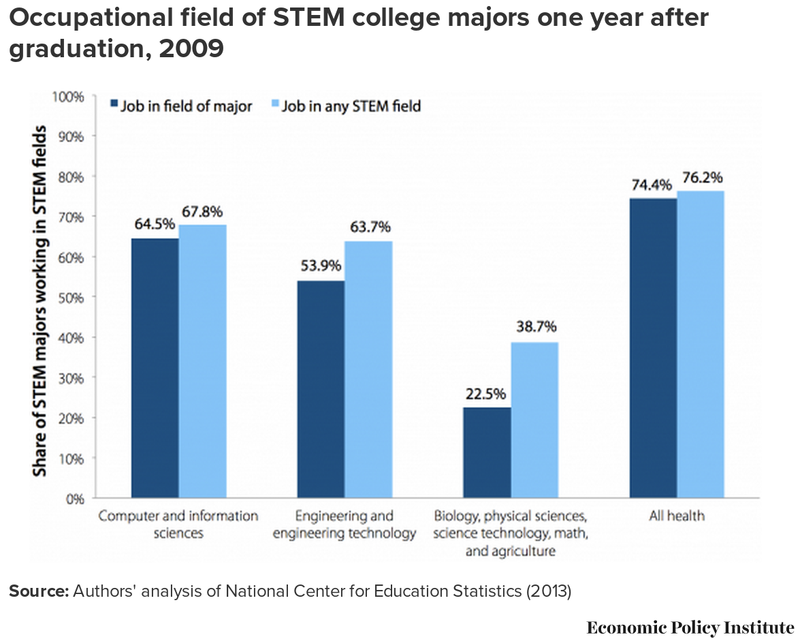 Only half of students graduating with a STEM degree are able to find STEM jobs. Anyway, since EPI appears to have been involved in a number of controversies, I'd like to know if this finding (whether to STEM overall of just IT) is corroborated by others. Furthermore, it appears that the data is from 2009 (see slide below), so close the peak of the last financial crisis. So, I'd also like to know if the finding is reasonably generalizable across the last one or two decades because the implications drawn from it (either in The American Prospect or EPI report itself) don't have much in the way of "buts" or circumstantial caveats. However, the Productivity Commission says STEM graduates fare poorly in the job market, apart from those who have studied healthcare, mining engineering and surveying. The outlook for mathematics and computer science qualifications are only slightly below average, however there are big gaps for graduates in life sciences, chemistry and the physical sciences. Of those who do get work, many are in an unrelated field. About a quarter of people with science degrees say their qualifications are not relevant to their employment. The same is true for 30 per cent of people with information technology degrees. Instead, they are working in fields such as sales, administration and community work. Not the answer you're looking for? Browse other questions tagged united-states education employment .